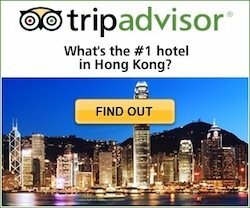 If you have had enough of the towering skyscrapers, crowded markets and hectic traffic, take a day or half-day respite, there are certainly some beautiful areas a short ride away and Hong Kong's convenient transportation makes a visit out of the city a snap. For wildlife lovers, Hong Kong's New Territories are a heaven for birdwatchers specially in the winter months when tens of thousands of migratory birds flock to the marshes and mudflats of Deep Bay, including several endangered species like the black-faced spoonbill. The outlying islands offer beautiful walks and hike trails, complete your outing with a stop at a seafood village for brunch or dinner... It is all just a short ferry ride away from Central. And yes, there are the beaches also, although terribly crowded on weekends and public holidays during the summer months when everyone is wishing for a cool splash. Here are some of our favorite places and things to do to enjoy the outdoors, the wildlife and the natural beauty of Hong Kong. Hong Kong is home to fantastic ecosystems offering a rich habitat for resident and migratory birds. These areas in the New Territories are a bit far from the city but can be easily accessed with public transportation. 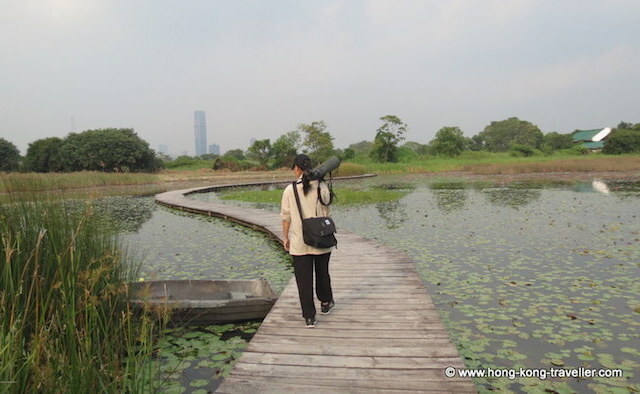 There are two main parks or reserves dedicated to the protection and conservation of the habitats and wildlife of the area, the Mai Po Nature Reserve and Hong Kong Wetland Park. Hong Kong is also home to the unique and endangered Pink Dolphins. Here's more on Hong Kong's Nature and Wildlife. The Mai Po marshes in Deep Bay in the New Territories are a protected area and an important bird sanctuary where hundreds of migratory species find their way in the winter months, making it a paradise for bird-watchers and nature lovers. 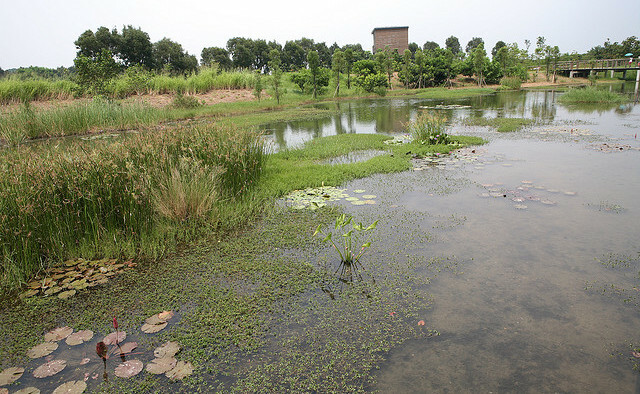 This is a fragile ecosystem located just a stone-throw away from mainland China. The reserve is jointly managed by the World Wildlife Fund and the Hong Kong government. Visitors need a special permit to enter the protected areas and this can be obtained online. Here is a guide for visiting the Mai Po Nature Reserve. Boardwalks, lily ponds, bird hide stations, mudflats, fish ponds, mangroves, a beautiful butterfly garden and an informative visitor center at this 60+ hectares of wetlands. The Park is great for kids with many interactive displays, which also makes it a magnet for school field trips. Although not precisely "around the corner", transportation is easy with the MTR or the direct bus from the city, just allow about an hour to get there. 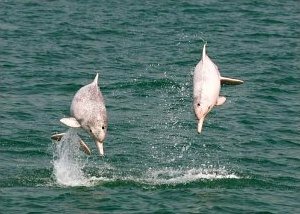 Go on a Pink Dolphin Watch cruise and look for this rare and endagered species that inhabits the waters surrounding Hong Kong. Kids specially enjoy the cruises which provide a way to enjoy and observe these lovely creatures in the wild. The trip is conducted in a way that minimizes disturbance to the dolphins, and it is at the same time an educational experience as the guides are very knowledgeable about the Chinese dolphins and are more than happy to tell you all about them, their habits, characteristics, habitat and the plight they face. Repulse Bay is just a short bus ride from the hustle and bustle of the Central District and one of the easiest to get to, easy for a half-day outing that can be combined with the nearby Aberdeen Fishing Village. Located in a spectacular sheltered bay framed by the mountains overgrown with high end condominiums and townhomes, it is Hong Kong Island's popular weekend retreat. Another bonus for visitors is the colorful temple located in the south-east end of the bay, a beautiful collection of mosaic deities, statues, shrines and pavillions. 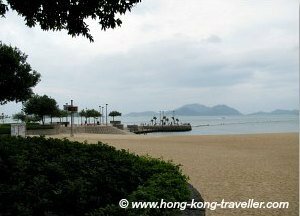 Here's more on Repulse Bay Beach. Stanley is a beautiful seaside village in the southern part of Hong Kong Island, although more well-known to tourists for its lively market than for its beaches, it has a pleasant waterfront promenade lined with small pubs and cafes. It is only a 50-minute bus ride from Central, but one of our favorite outings include taking the Aqualuna, the gorgeous red-sail sampan, that sails on weekends to Stanley. That way you combine a harbour cruise that leaves from either Central or the Tsim Sha Tsui Ferry piers and brings you in an hour and a half to Stanley. You can then stroll the promenade, get a bite to eat, relax by the beach, pick up a few souvenirs at the market and then catch the bus back to the city whenever you are ready. Here's more on Stanley Village and Beach. Sai Kung is a delightful picture-perfect seaside town in the eastern part of the New Territories. It takes about one hour and a combination of public transport to get to it as there is no direct MTR station nearby but it is well-worth the time and effort to get there. The main draw to the town is a very colorful and bustling floating market and the waterfront seafood restaurants. 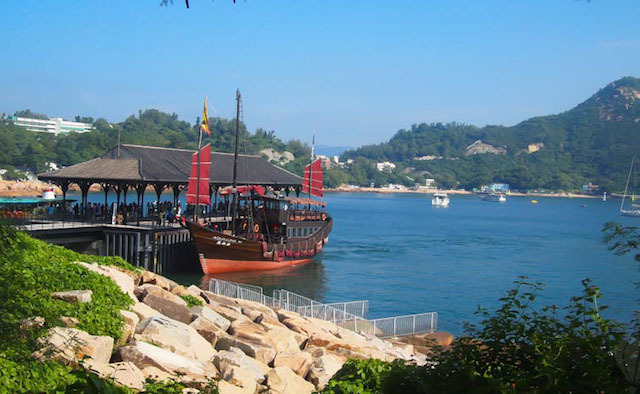 In addition, Sai Kung Town is a gateway to the surrounding area which contains fantastic country parks with the territory's most fabulous hiking spots and beaches, a myriad of small islands and also the Hong Kong UNESCO Global Geopark. Here's more on Sai Kung Fishing Village and many options for outings in the Sai Kung Peninsula . Perfect for a half-day or day trip, the outlying islands are great for all sorts of outdoor activities: leisurely walks and hikes, swimming in crystal clear waters, kayaking, etc. Getting to the islands is easy with Hong Kong's vast, convenient and inexpensive ferry system. Cheung Chau Island is a little jewel of an island which is mainly known for its iconic Bun Festival in May. But festival or not, a visit to this small island is well-worth your time whether you have only a few hours or a whole day. Getting to the island is totally hassle-free with frequent ferry service from Central Pier 5. It takes only 40 minutes to get there and once in the island, there is much to keep you busy. 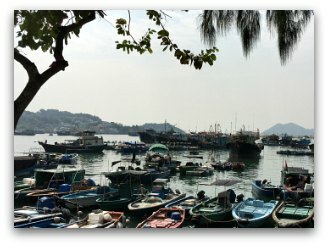 Coastal hiking walks and paths with stunning views, even a "Mini Great Wall"
Cheung Po Tsai Cave, "the pirate's den"
Here's more on Cheung Chau Island . 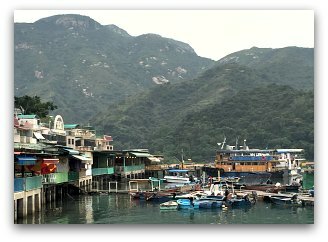 Whether for a day or only a few hours, Lamma Island is another great option for an escape from the tumult of the city and it is only a 20 minute ferry ride away. It is one of the very few places in Hong Kong that still hangs on to its old fishery ancestry customs and traditions and a real treat to visit any time of the year. Lamma has some of the best hiking trails in Hong Kong, a very enjoyable activity during the cooler months. If temperatures run high, then the beaches are a better option. And one of the main highlights? Its seafood! All year-round! There are two main villages with a hiking trail that connects both. Yung Shue Wan is the main "town" with a livelier vibe. Sok Kwu Wan is the small "fishing village town". Sok Kwu Wan's waterfront is lined with seafood restaurants where you can sit out in the open and enjoy the views from the lively harbour. Here's more on Lamma Island. 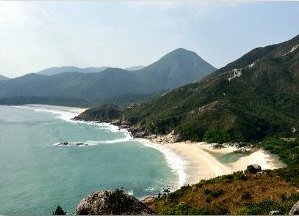 Rugged mountains, untouched beaches, gleaming waterfalls... get out of town and enjoy the beautiful landscapes of rural Hong Kong. There is something for all levels of trekking enthusiasts. But you don't really have to go far, some of the best views and strolls are right from Victoria Peak in Hong Kong Island. For the DIY trekkers, by far the most comprehensive resource on anything Hong Kong Outdoor-related is Martin William's Website www.hkoutdoors.com which I encourage you to check out. The following are some top picks for guided hikes, some are offered only during the dry and cooler season autumn through spring when temperatures are most pleasant. Arguably the crown jewel of rural Hong Kong, the Sai Kung peninsula is genuinely idyllic and remote offering you the perfect way to escape from the city and experience a different side to Hong Kong. With no roads in sight, the only way to get there is to hike or come by boat. With mountains, waterfalls, beaches, unique rock formations and more, Sai Kung is most unlike the rest of Hong Kong, and is the perfect destination for travelers looking for a more 'off the beaten track' experience. From mountain ridges and secluded forest trails, to the white sands of Tai Long Bay, it's no surprise the Dragon's Back trail was named by Time Magazine as Asia's best urban hike. 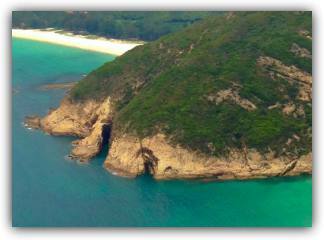 First navigate the dragon-like peak from which the mountain got its name and then descend down to the beautiful white sands of Tai Long Bay where you can have a swim or even sport some surfing. Finish the day's hike by enjoying a nourishing meal and refreshing beverage - the perfect way to cap off an awesome day! 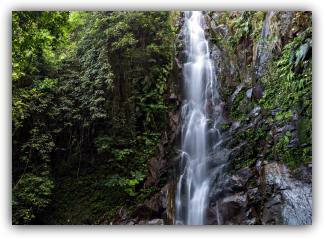 Nestled within dense jungle on the breathtaking slopes of Tai Mo Shan mountain, lie the Ng Tung Chai Waterfalls. The falls which are the main stop on this 3 hour hike are actually a collection of spectacular falls spread over several kilometres, each more dramatic than the last. The hike finishes at the spectacular 'Main Falls', the highest in Hong Kong. Along the way, climb past rural villages and temples into a world far from Hong Kong as you know it. Hidden within the dense jungle you can uncover some truly stunning places. The city never felt so far away. 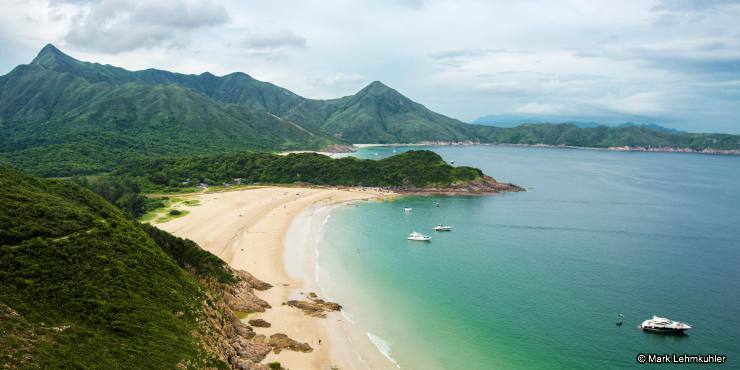 Lantau's diverse landscape offers a unique side to Hong Kong unbeknown to most travellers. 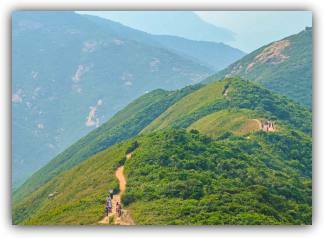 Lantau Peak, Hong Kong's second highest point, is also one of the toughest peaks, even for serious climbers. 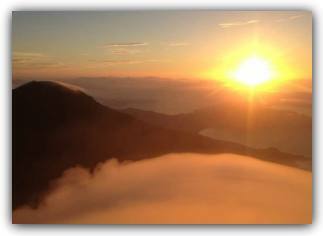 Typically beginning around 4:00am, climb up the mountain's north ridge to reach the summit just in time to enjoy the amazing sunrise from atop Lantau Peak. Then, one has a choice of routes down, either returning via the north ridge or tackling the south face finishing with a visit to the Tian Tan Buddha.